Can Salesforce.com Inc. Regain Its Mojo? Better profit growth and smart acquisitions could restore investor confidence in this cloud leader. Salesforce.com (NYSE:CRM), the largest cloud-based CRM (customer relationship management) platform vendor in the world, has had a tough year. The stock has fallen 10% this year due to concerns about slowing sales growth, questionable earnings growth, and rising competition. However, the stock might regain its mojo if it achieves three key goals in the coming year. Salesforce's revenue rose 25% annually to $2.14 billion last quarter, and its non-GAAP net income grew 22% to $170.9 million. However, Salesforce's GAAP net loss also widened from $25.2 million to $37.3 million during that period. That disparity is attributed to the high cost of acquiring new customers (which requires big investments in sales and marketing), and the comparatively low cost of its cloud-based services due to heavy competition in the SaaS (software as a service) market. The bears often cite this as evidence that Salesforce can't squeeze out a profit regardless of how much revenue it generates. 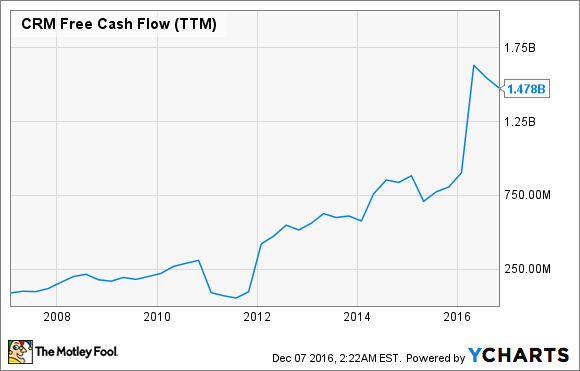 However, Salesforce's free cash flow -- an arguably better gauge of high-growth tech companies -- remains incredibly strong. Nonetheless, taking steps to generate consistent GAAP profits would silence critics and boost the company's stock price. Salesforce achieved GAAP profitability on a quarterly basis before, but it hasn't booked a full year of GAAP profits in recent years (although it could do so this fiscal year). One of Salesforce's core strategies is inorganic growth. Many of its core services today were built upon acquisitions -- Activa Live Chat became Salesforce Live Agent, Assistly became Zendesk rival Desk.com, ExactTarget became the Marketing Cloud, and RelateIQ and Tempo now power SalesforceIQ. That shopping spree continued this year with seven more acquisitions. Salesforce can attribute much of its sales and FCF growth to that strategy, but some critics are concerned that the company will "diworsify" its business as weaker businesses drag down its top and bottom line growth. That's why Salesforce stock plunged in early October when reports claimed that it was interested in buying Twitter (NYSE:TWTR). Some aspects of Twitter, like its data licensing business and popularity with sales reps, might have generated synergies with Salesforce, but its stagnant user and ad revenue growth would have weighed down Salesforce's bottom line. That's why Salesforce stock rebounded after the talks ended. If Salesforce keeps making smart and disciplined purchases in 2017, it could continue posting 20%+ sales growth per quarter. Salesforce is the biggest CRM vendor in the world according to Gartner. It controlled 19.7% of the global CRM market in 2015, compared to 10.2% for SAP, 7.8% for Oracle, 4.3% for Microsoft (NASDAQ:MSFT), and 3.6% for Adobe (NASDAQ:ADBE). Salesforce, Microsoft, and Adobe all grew their market shares year-over-year, while SAP and Oracle's shares declined. However, Microsoft and Adobe have become much more aggressive recently. Microsoft's acquisition of LinkedIn and its introduction of Skype Teams indicates that it will heavily support its Dynamics CRM platform with deeper enterprise connections. Adobe's Marketing Cloud, which generated $404 million in revenues last quarter, has also become bigger than Salesforce's Marketing Cloud, which generated just $247 million in revenues last quarter. In an ironic twist, a recently leaked email reveals that Salesforce once considered LinkedIn and Adobe to be two of its top takeover targets. Therefore, Salesforce must add new features, like its new Einstein AI-powered CRM service, and acquire other companies to widen its moat to keep Microsoft, Adobe, and other challengers at bay. So can Salesforce.com regain its mojo? Even after its decline, Salesforce stock doesn't look cheap with a trailing price-earnings of 239 and forward P/E of 55. However, its "best in breed" reputation in the growing CRM market and its robust sales growth should keep investors interested. If it can improve its GAAP profits and make smart acquisitions next year, I think the stock could fare much better than it did in 2016.